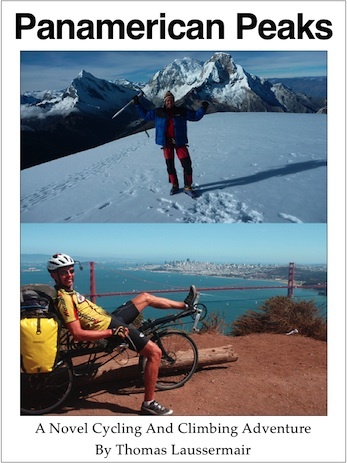 yesterday I crossed the 15.000 km mark on my Panamerican Peaks journey, again time to reflect. In November / December I had to contend with lots of heat and humidity through Central America. I also climbed the highest peaks of El Salvador (El Pital), Honduras (Las Minas), Nicaragua (Mogoton), Costa Rica (Chirripo, with Jill!) and Panama (Baru). None of these was too difficult from a mountaineering perspective, except perhaps Chirripo, which was far more strenuous (and rainy) than we thought. But it all required some logistics and often an extensive side trip by bus. Those side trips were an adventure in itself and provided a nice break in the cycling routine. A selection of all those trips can be found on my photo page (see links below). My timetable was such that I wanted to get home by Christmas; sure enough, after several long days at the end I crossed the Panama Canal – marking the end of the North and Central America section – and reached the Panama airport. Then I caught a plane to Florida and spent the next 2 weeks at home with family. Good time to reconnect and to gain most of the pounds back which I had lost while riding long days… I also brought the bike to a shop for preventive maintenance and had some worn out parts replaced. This required packing and unpacking the bike a total of 4 times (in & out the Panama and then Patagonia bike box). On Jan-11 the journey continued. This time I flew via Buenos Aires to Santiago de Chile, where I spent one day and left my mountaineering backpack behind (for expeditions on Aconcagua and Ojos de Salado in late February and March). On Jan-13 I continued by plane via Punta Arenas down to Ushuaia. Here I cycled down to Bahia Lapataia, the Southern end of the Panamerican Highway. I attached two photos from Prudhoe Bay (Alaska) and Bahia Lapataia (Argentina), the Northern- and Southern-most points of this journey. Since Jan-14 I have been riding North through Patagonia. It’s a land of rugged beauty, with many extreme challenges for cycling, primarily the relentless wind, as well as rough gravel roads, hills and rain. I have crossed the border back & forth between Argentina and Chile several times, the last time via an adventurous hiking trail (pushing the bike) and several ferry crossings (once getting stuck for two days in the middle of nowhere due to one ferry ride being cancelled) and am now riding North on the Carreterra Austral – the Chilean counterpart in the South to the Alaska Highway in the North. The scenery down here is of stunning beauty, with snow-capped mountains and glaciers feeding innumerable waterfalls flowing into many crystal-clear lakes, surrounded by rainforest. But for this one gravel road there is a lot of untouched wilderness here, with very little traffic (~ 5 cyclists and 15 cars per day). The fund raising for MSF (Doctors Without Borders) has made some good progress over the holidays, with the latest at $3360. This is especially gratifying in light of the news of such natural disasters as the recent Earthquake in Haiti, where MSF has been very active to support the many victims. Many thanks to all who have donated! Now on to Santiago de Chile and Mendoza in the next 3 weeks. Then I will join a friend (who I met on Pico Orizaba) for the two expeditions on Aconcagua (Argentina) and Ojos de Salado (Chile), both near 7000 m and the highest peaks of this journey.